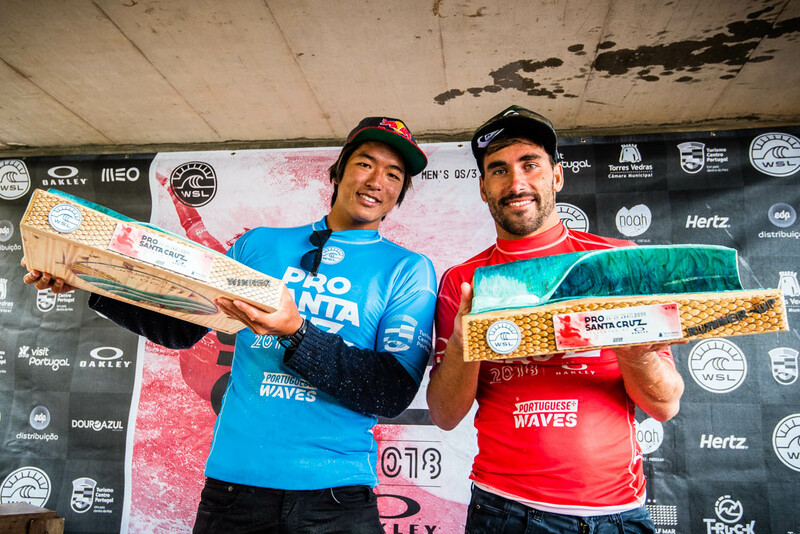 Kanoa Igarashi (JPN) has won the Pro Santa Cruz 2018 pres. by Oakley in historic fashion today, claiming victory in the Final against Aritz Aranburu (ESP) held in three-to-five foot surf at praia da Fisica in Santa Cruz. Stop No. 6 on the 2018 World Surf League (WSL) European Qualifying Series (QS), the Pro Santa Cruz 2018 pres. by Oakley has been treated to a mixed conditions from clean and small to big and unruly, culminating today with Igarashi’s victory. Igarashi had a near-perfect path to the final and rebounded after a close encounter in Round Six to post the highest numbers of the Quarters, Semis and Final. The Current World No. 24 who had a rather slow start on the Championship Tour so far can count on his result this week to boost his morale heading into the rest of the season. Aritz Aranburu (ESP) posted some of the event’s biggest scores and combined heat totals on his way to the Final but fell short of keeping his rhythm going for another heat. A former CT competitor as well, the Spaniard remains a constant threat on the Qualifying Series and could very well lead a re-qualification campaign to fruition if he continues to perform at this level. Ramzi Boukhiam (MAR) had a stellar run in Santa Cruz, but couldn’t quite find any wave of consequence in his semifinal bout against Aranburu and eventually settled for equal third, his best result of 2018 so far. The Moroccan had previously upset the local community when he eliminated the last Portuguese in contention, Frederico Morais. Victor Bernardo (BRA) suffered a similar fate than Boukhiam, and had to watch his opponent Igarashi on all the best waves of their Semifinal while he was left scouring the lineup empty handed. The equal third place in Santa Cruz is the Brazilian’s best result this season as well and will give him plenty of confidence going into the rest of the season. All hopes of a Portuguese event title in Santa Cruz rested on Frederico Morais (PRT), whom unfortunately couldn’t surf past Boukhiam in their Quarterfinal matchup.